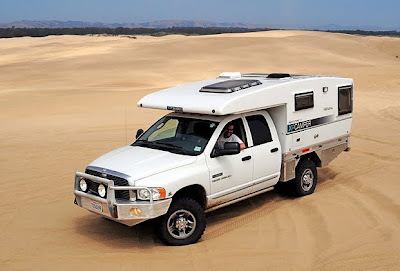 Earlier this year when Jimmy and I were spending part of our winter on the Gulf Coast of Texas, I met solo RVer Jacque Green from Tulsa, Okla.
She was traveling with Johnson, an energetic two-year old Spaniel mix, in her 2013 Coachmen Prism 24G Class C motorhome. 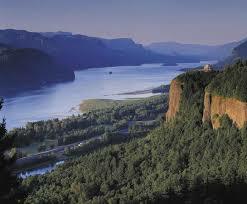 At that time she talked of heading to the Pacific Northwest in the spring. “I’m planning on taking three months to get to the Olympic National Park in Washington state. It is a place I have always wanted to see,” she said. Well, guess what, she’s made it to the Pacific Northwest and recently stopped by to see us in southern Oregon. 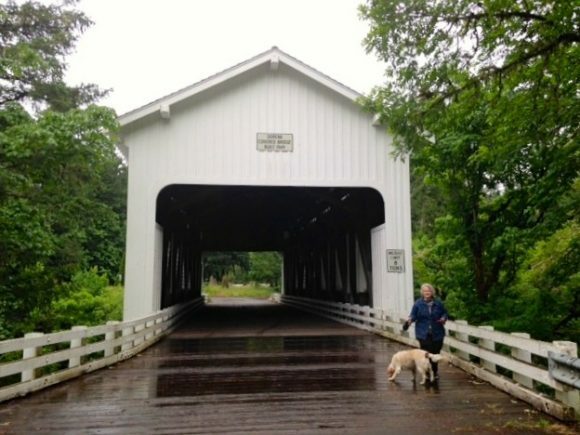 While she was here, Jacque, Johnson and I spent the better part of a day checking out the Covered Bridges of Cottage Grove, Ore. (click here for an article I wrote on the bridges for RVShortStops). This 5’1″ adventurous 70-something is now heading up the Oregon Coast and soon will be camping on the Olympic Peninsula. Photos: (Top) Jacque Green and Johnson walking across the covered Dorena Bridge. 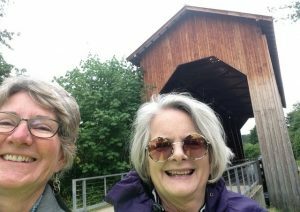 (Bottom) Gal pals Julianne (left) and Jacque at the Chambers Bridge in Cottage Grove, Ore.